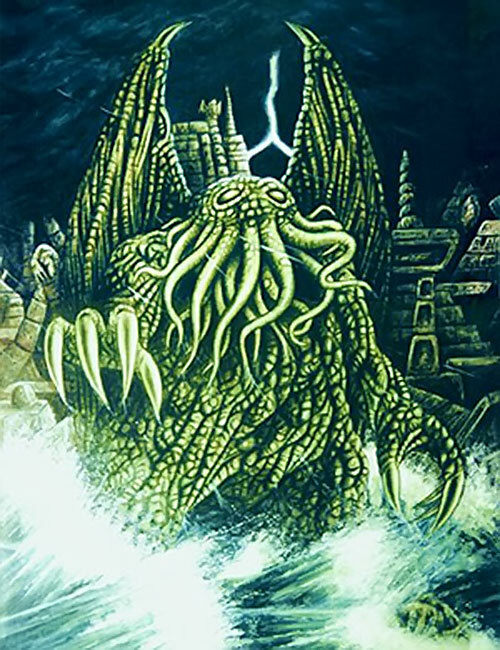 Cthulhu first appeared in a pulps story by H.P. Lovecraft in 1928. 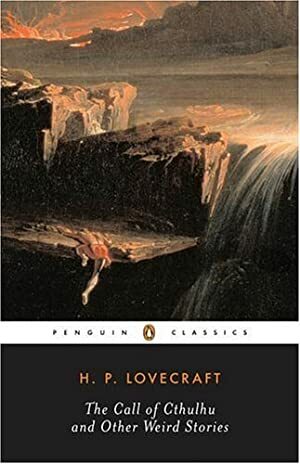 Lovecraft would eventually be considered a major genre writer. His core work are paranoid tales of cosmic horror about mankind’s insignificance. In these Cthulhu is a Thing Man Was Not Meant To Know – an incomprehensibly alien and powerful thing. Lovecraft first came to prominence among geeky subcultures. Tabletop role-playing games based on his Cthulhu mythos were classics, especially in Europe. Thus, wondering what stats this being would have in the DC Heroes RPG was a cosmic inevitability whose many impossible angles will shatter the mind of those who gaze at it for too long. As usual. Known Relatives: Star Spawns of Cthulhu. Group Affiliation: The Great Old Ones, former Elder God; as Azathoth High Priest, head of many dark churches. Height: 150’ Weight: 300 tons Age: Millions of years. Cthulhu is an alien lifeform, referred to as a Great Old One. As such, he’s an ancient colossal beings that ruled cosmos for millions of years. The Great Old Ones were cast down for their dark magic practices by the Elder Gods themselves and banished to various locales across the universe. Cthulhu and its Star Spawn arrived on Earth millions of year ago, and ruled the continent R’lyeh. After thousands of years battling the Elder Things, pentagonally-focused beings who also invaded Earth, the continent of R’lyeh was sunk beneath the seas. 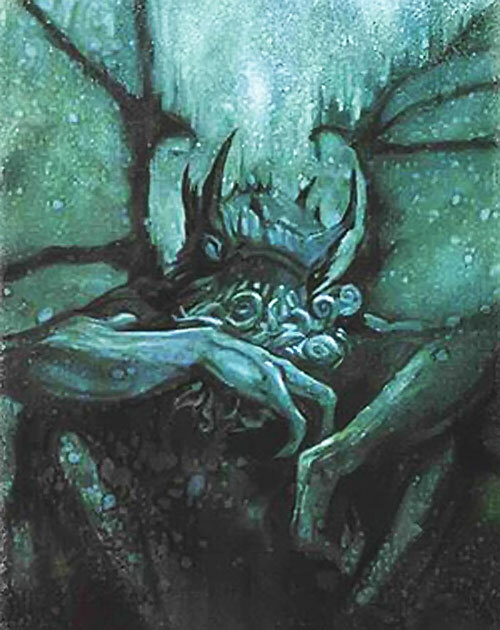 This trapped Cthulhu into an eternal sleep (treat this as Suspension: 40). Cthulhu may be asleep, but his dreaming continues to corrupt the world. When R’lyeh nears the ocean surface (as it does every few decades), Cthulhu’s dreaming psionically invades the subconscious of the human population. That inspires Cthulhu cultists and drives many psychic-sensitive insane. A horrific behemoth with cuttlefish, squid-like head and human body. Vestigial wings grow from his back, and his clawed hands and feet are enormous. Cthulhu has total control over its body. He can grow his vestigial wings for actual flight, or stretch his tentacles for great distance. But he must keep his general shape and form and therefore will always be encountered with looks quite similar to this general appearance. This may be related to his restriction to fit just three dimensions. Cthulhu is incredibly powerful. He considers humanity as either total slaves that must offer their lifes and souls to their true owner or as ants to be destroyed. Despite being dormant, Cthulhu’s mind continually prepares the world for his return. Every time he nears the ocean surface, thousands of humans are stricken with terrible nightmares, and strange, dark events take place. As with many beings of the Mythos, those who observe Cthulhu risk being driven insane due to a warping of reality. All of that can only conjure a terrible and immensely powerful force of personality, one that could make even the mightiest tremble. Asmodel, Trigon, Darkseid… Cthulhu can just fit perfectly in the DCU. If used alone, perhaps the Lords of Order trapped him beneath R’lyeh. If introducing the entire Cthulhu Mythos to the DCU, mystic beings like Swamp Thing, Dr. Occult, John Constantine, Arion and Dr. Fate will surely have battled Cthulhu’s minions attempting to recover his grip over our world. The exception could be Phantom Stranger, which many rumour would be one of Nyarlathotep’s thousand forms. The most active trend of combatants against the Cthulhu Mythos would have been contemporaries to the early pulp heroes, before the masked vigilantes entered the scene. The Spider, Ka-Zar, the Shadow, the Green Lama or Solomon Kane would certainly have fought this influence ! There are also established “bridges” between Lovecraft’s mythos and the world of Conan. 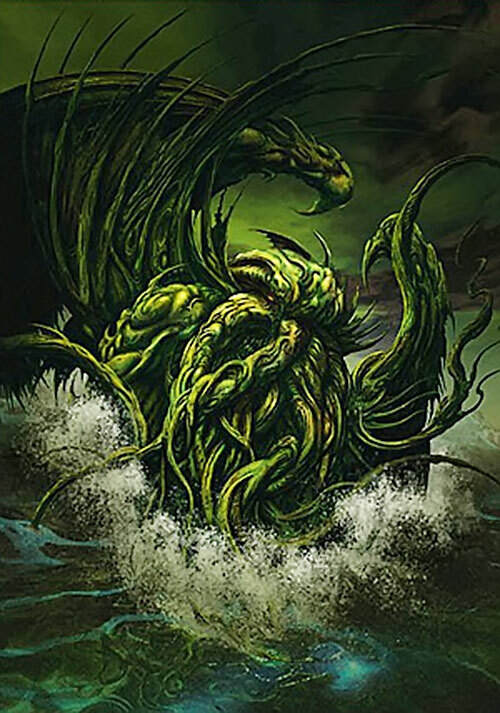 Cthulhu (or at least the Great Old Ones) may already exist in the DCU, as seen in the Batman/Starman/Hellboy crossover. Aura of Fear as a Horror Check: if RAPs equal the victim’s MIND, he also gets a temporal mental disorder (Irrational Fear, Psychological Instability, Traumatic Flashbacks) for 2d10 APs of time. (+2). The mental disorder turns to be permanent if RAPs double (or +) said MIND (+4). The GM may enforce the disturbing nature of Cthulhu by forcing Perception checks on Cthulhu and comparing the higher of the resulting RAPs or the Aura of Fear RAPs with the victim’s MIND to see if there is any mental disorder. All this also applies if Cthulhu tries to explicitly Intimidate one single creature (with his INFL/AURA as AV/EV and the usual bonus due to Strange Appearance) (+6 to those attributes) Aura of Fear adds the Growth’s bonus to Perception Checks to its AV (+1). Aura of Fear has +5 range (+1). Extra Limb: Grappling Bonus (+1). Fog: only while Cthulhu’s regenerating (-3). Growth is always on and already noted on STR (0). Invulnerability also works on MIND and SPIRIT (+2). It can’t bring BODY over 0, unless the “stars are right” (-1). Regeneration: Recovery Checks are automatic (+2) and they recover 1 RAP each (-2). While regenerating, Cthulhu can’t take any action (dice or auto), until it reaches full BODY (-2). Regeneration works on BODY only (-2). Sealed Systems: Ineffective against radiation (-2). Systemic Antidote: Radiactive Poisoning Defense (+1). Extra-limb are its facial tentacles. Area Knowledge (R’lyeh), Expansive Headquarters, Iron Nerves, Leadership, No Vital Areas, Scholar (“Lovecraftian” lore). Great Old Ones (High, Powerful), Cthulhu cults (High), Minor Races (High, Powerful). Altered Anatomy, Arch enemy (Outer Gods), Exile (Involuntary, at R’lyeh), Strange Appearance, Attack Vulnerability: Magic, -2 CS; Misc: subject to any other drawback inherent to the Great Old Ones (such as being warded of by some symbols and entities). Effect: Phobia: 12, global range. Special Restrictions: Needs a sacrifice. I used Omni-Power instead of Sorcery so he has a reason to use all those worshippers that Multi-Attack with his Occultist when performing really powerful Rituals. 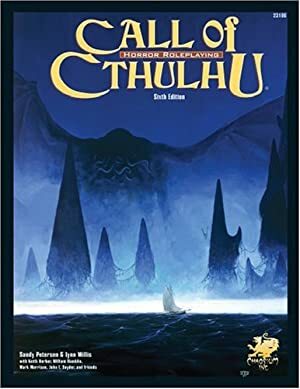 Source of Character: Call of Cthulhu Role Playing Game (both Chaosium and D20) and some Lovecraft tales. Helper(s): Sean MacDonald, Kevin Mulder, Joshua Marquart, William Chamberlin, Brian Patrick Young, Phil Dixon, Roy Cowan, John Colagioia, Capita Senyera.